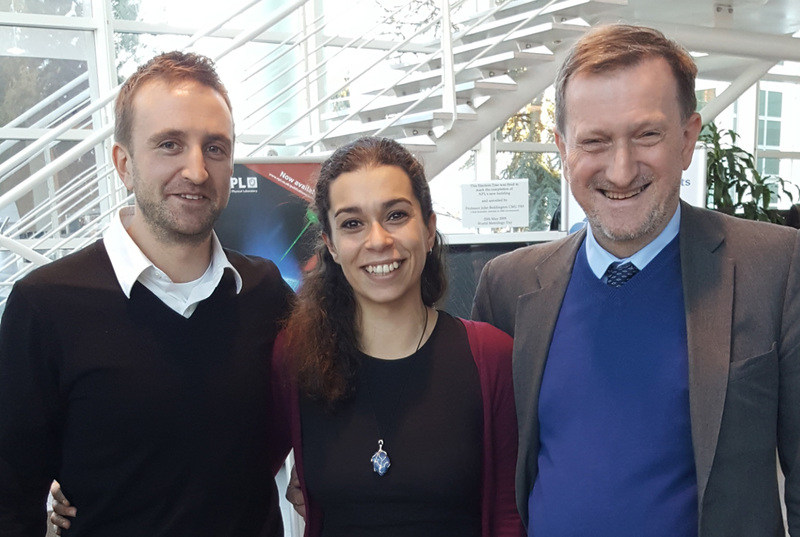 Eleni Michalopoulou (centre) with project partner Tim Arnold (left) and Prof. Mike Czerniak (right). Eleni Michalopoulou, a third-year PhD student in the School of Chemistry, explains how she came to be a contributing author on an important Intergovernmental Panel for Climate Change report. I think now, looking back a year later, it was my inner physicist that helped me look at the problem from a different perspective. ‘The problem’ here was why there was such a big gap in the measurements of CF4 — a nasty greenhouse gas, historically emitted by the aluminium and the semiconductor industries, that has a global warming potential (GWP) of 7360 and a half-life of 50,000 years. This perfluorocarbon is the focus of my PhD research in the Atmospheric Chemistry Research Group. In particular, I’ve been trying to work out why there’s quite a big gap between what we call a top-down estimate, which broadly means the amount of CF4 we measure in the atmosphere, and the bottom-up inventories, which are compiled from several bodies and/or different industries. These three years that I have been working on my project, which is sponsored by Prof Mike Czerniak and Edwards Ltd, have been wildly interesting. I had the opportunity to look very closely into the aluminium and semiconductor industries and their emissions, how their technology has changed over the time and how geographical shifts of the industries had an effect on the emissions of CF4 and other PFCs. However, the more I read about the industries, the more it seemed like there was something missing — something that would help explain the gap and the discrepancies. No matter how we looked at it, the emissions that came from the aluminium and semiconductor industries alone were not enough to explain those discrepancies. Since there was no explanation for the gap, given what we had already found and what we already knew, I started to look in the literature for other sources, either less known or less likely. Eventually, I found the work of Hanno Vogel at TRIMET Aluminium, which involved estimating PFC emissions that came from the rare earth smelting industry. I was so excited when I found that — mostly because I had taken the risk of spending quite a lot of time looking into something that could have been just a wrong idea or a bad hunch. Once we started the discussions with Hanno, it became very clear to us that we were both on to something. From his side, it was a ‘bigger picture’ point of view; from my side, the discrepancies and that gap now made so much more sense. Very soon afterwards we joined forces and started presenting our work at conferences. I think what really helped us make our case regarding the PFC emissions from the rare earth smelting industry was that his work combined with mine made a really good, logical argument — and good, logical arguments are always great when you are trying to do science! The best moment was when we presented our work to the head of the greenhouse gas section for the U.S Environmental Protection Agency. What we were suggesting about the contribution of the rare earths to the PFC emissions seemed to make so much sense to so many people. Not too long after that, we were notified that the Intergovernmental Panel for Climate Change (IPCC) was considering adding a brand-new chapter regarding PFC (and other greenhouse gas) emissions from the rare earth smelting industry, as part of its 2019 Refinement of the 2006 IPCC Guidelines for National Greenhouse Gas Inventories. We were, of course, absolutely thrilled to hear that! Along with the news of the new chapter came the nomination for both me and Hanno to be included as contributing authors for that new chapter on rare earth smelting and its associated PFC emissions. Eventually, we received the email from the lead authors confirming both of us as contributing authors for the chapter. I can’t speak on behalf of Hanno on this, but I sure spent a significant part of that day just absolutely bouncing around with joy. There is still a lot of work to be done of course, but I think it’s a great start!